Big, brash and trendy, or delicate, subtle and chic, hoop earrings let your style and personality show. Choose from gold, platinum, silver or white gold and add some sparkle to anything from everyday wear to an elegant evening dress. Unique 14k Gold link style Hoop Earrings. Available in 14k White, Yellow, or Rose gold these exciting hoops measure 19.65mm top to bottom by 5.2mm wide. They weigh a substantial 5.8grams. Gorgeous 14k Rose and White gold braided hoop earrings. This pair of Italian crafted hoop earrings measures 26mm by 3.75mm wide. They weigh an average of 3.4grams. 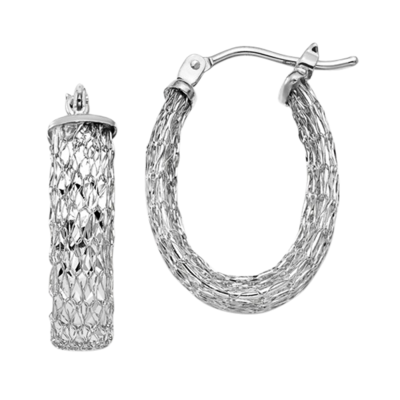 These hoop earrings are part of our "Lifetime Guarantee" collection. If ANYTHING happens to these we will replace them PERIOD. You can't beat that. Classic 14k White gold Endless hoop earrings. These runway style hoops are available in a large variety of sizes starting with our 17mm selection. Measure 1.5mm thick. 14k Gold Two-Tone polished hoop earrings. 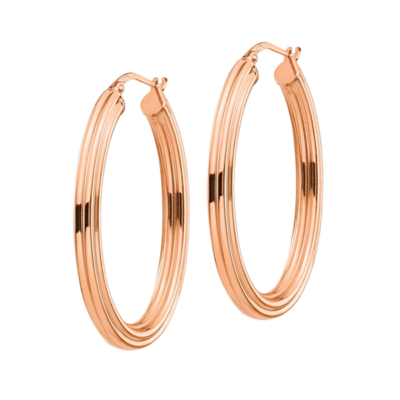 This pair of hoops measures 21.75mm top to bottom by 15.8mm wide. (front to back width) Price is for the pair with a leverback closure. This pair of hoop earrings are part of our "Lifetime Guarantee" collection. If this item for whatever reason should become broken, damaged, or defective, simply return it for a prompt replacement PERIOD. If for some reason the item is no longer available we will replace with a similar item. 14k Gold Tri-Color polished hoop earrings. This pair of hoops measures 28mm top to bottom by 5.8mm wide. Price is for the pair with a wire and clutch closure. 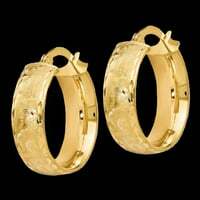 14k Gold Diamond Cut Oval hoop earrings. This pair of hoop earrings is available in 14k Yellow or White gold selections. They are Italian made and measure about 21mm top to bottom by 4.9mm wide. They are 1.8mm thick. They are quality Italian made hoops. 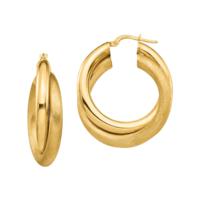 14k Gold Grooved Oval hoop earrings. This pair of hoop earrings is available in 14k Yellow, Rose, and White gold selections. They are Italian made and measure about 38.4mm top to bottom by 25.75mm front to back. They are 3.7mm thick. They are quality Italian made hoops. 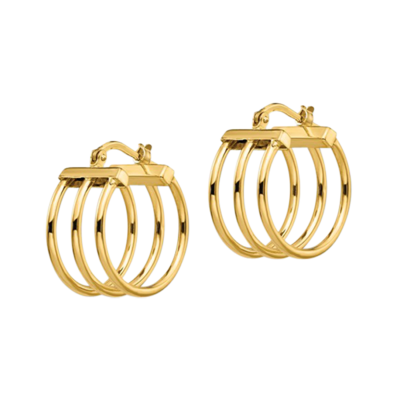 14k Gold Cage hoop earrings. These fun hoop earrings are a triple hoop design measuring about 20.8mm by 10.75mm wide. They are quality Italian made hoops. Order in 14k Yellow or White gold. 14k Gold Polished and Textured Fancy hoop earrings. These hoops measure 41.4mm in length by 35.5mm wide. Secured with a wire and clutch closure. 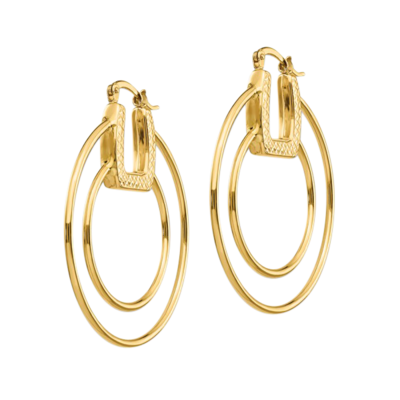 Order these Italian made hoops in 14k White or Yellow gold. Incredible 14k Gold Tube hoop earrings. 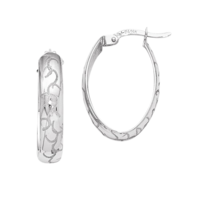 This Italian crafted tube style hoop earrings measure 29mm by 3.75mm thick. Hoops are available in 14k Yellow, Rose, or White gold. Hoops are part of our "Lifetime Guarantee" collection. If this item for whatever reason should become broken, damaged, or defective, simply return it for a prompt replacement PERIOD. If for some reason the item is no longer available we will replace with a similar item. Incredible 14k Gold Brushed and Polished twisted tube hoop earrings. This pair of hoop earrings are made in Italy. They measure 30mm and are created with a polished hoop twisted with a brushed hoop. Order this wonderful earring design in 14k Yellow or White gold. Italian Twisted Polished hoop earrings. 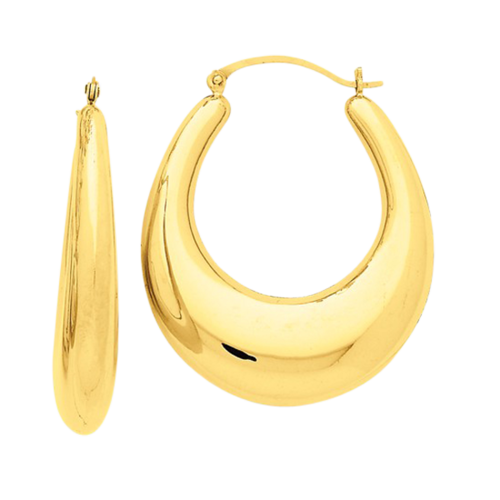 This 14kt gold earrings are made in Italy and measure 30mm by 3.65mm thick. Hoops are available in 14k Yellow, Rose, or White gold. 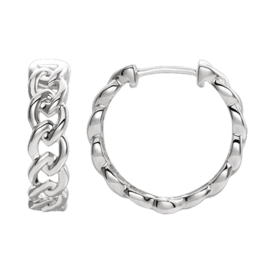 This pair of hoop earrings are part of our "Lifetime Guarantee" collection. If this item for whatever reason should become broken, damaged, or defective, simply return it for a prompt replacement PERIOD. If for some reason the item is no longer available we will replace with a similar item. 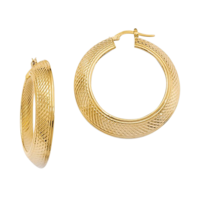 Stylish 14k Two-Tone gold polish and textured hoop earrings. This pair of earrings measures 25.70mm in length by 19.1mm wide. Great design features a wire and clutch closure. This pair of hoop earrings is part of our Lifetime Guarantee collection. Beautiful 14k White gold polished laser hoop earrings. 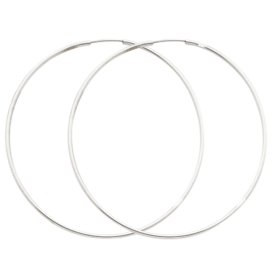 This pair of oval hoops features a lovely laser design and measure 23mm top to bottom by 4.7mm thick. Very pretty hoop earrings. Italian made 14k yellow gold polished and textured hoop earrings. This pair of unique hoops measures 38mm by 6mm wide. Beautiful 14kt Gold Creole style hoop earrings. 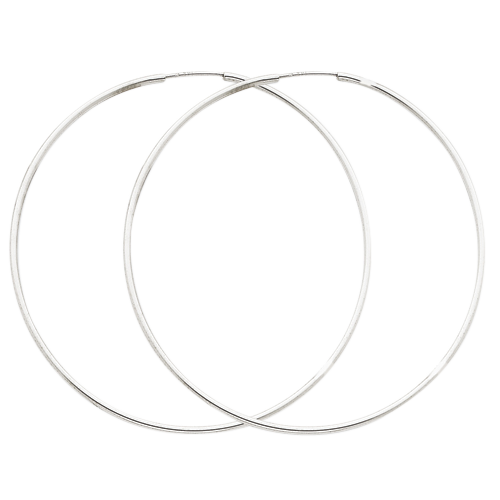 This pair of polished hoops weigh an impressive 5.39grams. They measure 22mm by 7mm wide and are secured with a wire clutch style closure. 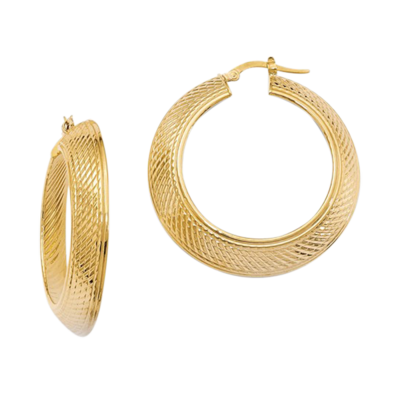 Stunning 14k two tone gold textured and polish design twisted hoop earrings. This lovely pair of hoop earrings is available in 2 popular sizes, a 23mm and larger 29mm in diameter selection. Both sizes measure 4mm in width. 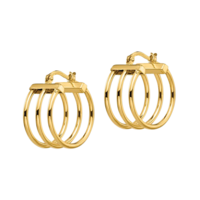 These gold hoops are part of our "guaranteed for life" jewelry collection. If they break for any reason we'll replace them PERIOD!!! 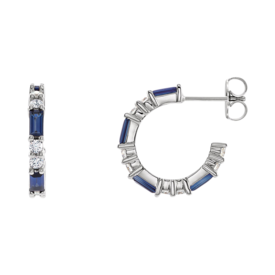 Stunning 14k Gold Blue Sapphire and Diamond hoop earrings. 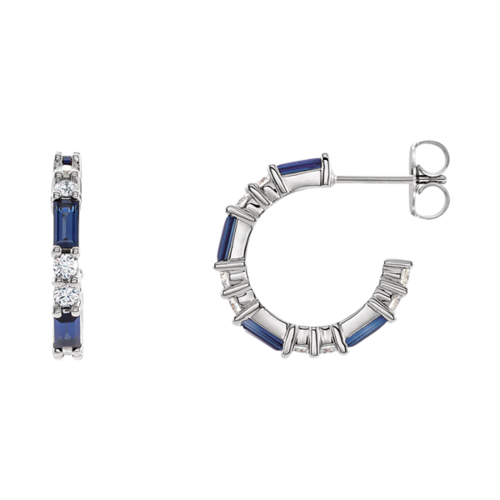 These hoops are set with 8 straight baguette faceted AA quality Blue Sapphires and 1/2 ctw round diamonds. This incredible style pair of diamond gemstone hoops is available in 14k white, yellow, and rose gold. Also Platinum (email for pricing). Tantalizing 14k gold laser etched design hoop earrings. Luxurious hoops are Italian made and measure 20mm outside diameter by 5.8mm wide. Hoops are available in 14k yellow, rose, or white gold. Hoops are part of our "lifetime guaranteed" collection. If this item for whatever reason should become broken, damages, or defective, simply return it for a prompt replacement PERIOD. If for some reason the item is no longer available we will replace with a similar item. 14k Gold Diamond huggie hoop earrings. 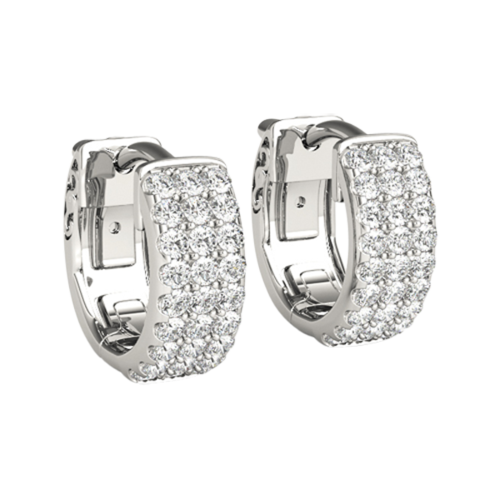 These exquisite diamond hoops total 1/2 carat for the pair. They are dazzling and measure about 1/2 an inch. Three rows of diamonds grace the face of these hoops and our price shown is for the SI 1-2 clarity G-H color. Also available in SI 1 clarity and the incredible VS 1-2 clarity F-G color. You'll LOVE these diamond hoop earrings. 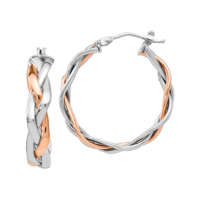 They are custom made to order and can be created in 14k White, Yellow, or Rose gold.